U.S. Immigration and Customs Enforcement has revealed that 124 illegal immigrant criminals released from jail by the Obama administration since 2010 have been subsequently charged with murder. Perhaps Kasich is hoping that this approach will get him over the top, along with now campaigning with another Establishment Insider Mitt Romney, in Ohio. To me, this is akin to selling ones soul and I am not trying to be overly dramatic. Kasich knows he has a snowballs chance in hell of winning the nomination. Romney knows it. Rubio knows it. The MSM knows it. And 100% of thinking American's know it. Yet, here he stands, not unlike Moveon.org, making his protest for the Elite, road blocking the popular front running candidate, making Socialist promises. It would seem all of hell has been unleashed against Trump. What can be the next roadblock? ’s presidential hopes diminishing as his personal demons catch up with him—from his relationship with billionaire Norman Braman to his role in pushing Obama’s amnesty—the donor class seems to be turning its eyes to John Kasich’s last stand in Ohio. “To think that that we’re just going to put people on buses and ship them to the border—look at our World War II experience where we quarantined Japanese—I mean it’s a dark stain on America’s history,” Kasich said in November. As Newsmax reported in August, when a New Hampshire town-hall attendee asked Kasich about illegal immigration and the burden illegal immigrants place upon the nation, Kasich dismissed the voter’s concern. Kasich similarly made no mention of last year’s report from the liberal Migration Policy Institute which found that there are nearly one million illegal aliens in the United States with criminal convictions (820,000). This figure was not an estimation of total crimes committed by illegal immigrants—which would be a much higher number—but only those illegal aliens successfully identified, arrested, tried, and convicted. Kasich also compared illegal immigration to cutting in line at a Taylor Swift concert: “I don’t favor citizenship [for illegals] because as I tell my daughters, you don’t jump the line to go to a Taylor Swift concert, you just don’t do it,” Kasich said. However, Kasich has made clear that he is open to giving illegal immigrants citizenship. Moreover, a report from Columbus Dispatch suggests that Kasich favors green cards for illegal immigrants, which is the main pathway to citizenship. If being “made in the image of the Lord” provides an exemption to America’s immigration law, then that would mean that all of the world’s seven billion people would be free to violate America’s immigration laws. 7) Kasich has called for implementing an open borders-style policy where workers can come and go as they please. Kasich claim that the nation’s guest worker program, which admits an unprecedented number of foreign workers into the country, is “too narrow” is astonishing—and places him squarely in the tiny minority of the Republican electorate, only seven percent of whom want to increase immigration. Moreover, Kasich’s call for a guest worker program that will allow workers to come and go as they please represents the central pillar of the open borders philosophy. Under this global one-world theory, any willing employer should be able to hire any willing worker regardless of the country in which they reside—thus removing any right that American workers be entitled to get American jobs. This is similar to the policy European countries have within the European Union—namely, people are entitled to move freely from one country to another. Kasich is essentially laying out how the same legal structure could be adopted for the United States and all the foreign countries of the world. 8) Kasich would enact amnesty within his first 100 days. In last Thursday’s CNN debate, Kasich told voters that he would enact the largest amnesty in U.S. history within his first 100 days in office. “For the 11 and a half million who are here, then in my view if they have not committed a crime since they’ve been here, they get a path to legalization. Not to citizenship. I believe that program can pass the Congress in the first 100 days,” Kasich said. Kasich has made clear that he does not want to discuss birthright citizenship as an issue. While Kasich previously supported ending birthright citizenship, he has since reversed his position—meaning he now supports giving citizenship to all children of illegal immigrants, or of tourists and guest-workers, who are born on U.S. soil. “If you are born here, you’re a citizen. Period. 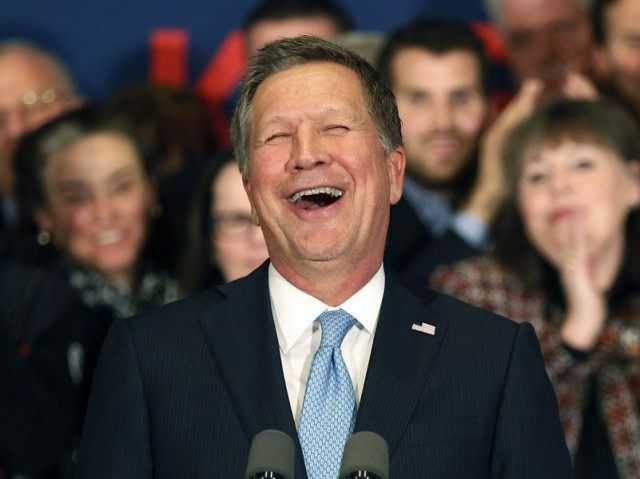 End of story,” Kasich told the Hispanic Chamber of Commerce last October.